Painting in Myrtle Beach | Get a Myrtle Beach Painting Contractor. Hello! My Name is Todd Shirley, I am Owner and Operator of Todd’s Painting & Pressure Washing LLC. 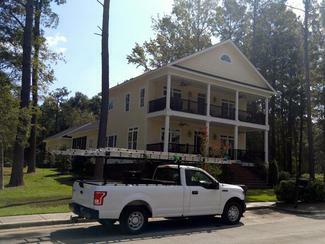 I am a Third Generation Quality Residential and Commercial Myrtle Beach Painter. At a Very Young Age I Followed My Stepfather Around, Observing All the Construction Trades. I Have Had the Opportunity of Working on Many Diverse Projects. I had started with Commercial Painting and Tract Homes Developments, Where I First Learned the Preparation Aspect of The Painting Trade. This is The Most Important Characteristic of Painting, If You Are Wanting a Very Nice and Clean Painting Project. Working on Custom Homes with My Stepfather Was a Rewarding and Educational Experience. Attention to Detail is Tested and Rewarded with Wonderful Results and a Project the Owner and I Can Be Proud Of. Rental Repaint Projects Are Also Very Rewarding to Me. They Will Test Your Skill, and the Ability to Turn Over Projects in Short Time Frames Without Taking Away Any of The Attention to The Details That Is Needed. I Worked My Way Up the Old School Way from The Bottom to Where I Am Now. The First and Only Job That My Stepfather Would Trust Me with Was Pressure Washing of His Exterior Repaints. Many Days I Would Spend Cleaning a Home or Condos Exterior, Getting it Ready for The Preparation Stage of Painting. I Then Moved My Way Up to The Preparation Stages of Painting, Which Every Painter in The Painting Field Should Master. Once I Became Proficient at This, I Was Trained with The Brush and Roller, Then on To Learning to Run a Spray Rig. I Have Put in Time Learning Other Trades as well, Like Drywall Finishing, Texturing, and Carpentry to Well Round Out My Skills. I Offer the Experience and Attention to Detail Needed for Your Painting in Myrtle Beach Needs. I Offer Very Reasonable Prices, Free Estimates All Over North Myrtle Beach, Myrtle Beach, and The Surrounding Areas. I Hope to Be Doing Business as Your Myrtle Beach Painting Contractor Soon! I am Licensed, Insured and Carry Workman’s Comp. Insurance.